Getting more Vitamin D in your diet reduces your risk of prostate cancer, and may even be critical in preventing aggressive forms of the disease. According to new research, there’s a strong correlation between low Vitamin D levels and aggressive prostate cancer (a risk that is twice as strong for African American men). Given past connections between Vitamin D and prostate cancer, it’s reasonable to assume that it’s low Vitamin D levels causing aggressive forms of the disease rather than the other way around. 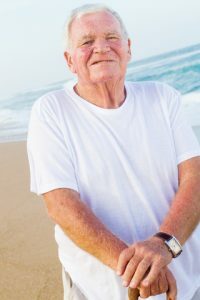 Prostate cancer is actually very common in older men, but relatively benign—as long as it’s the slow moving kind, most men will die of something else entirely before the prostate cancer bothers them. But if it’s the aggressive kind? Unless it’s caught very early, treatment is difficult. Luckily, it’s easy to get more Vitamin D! Just get a little more sunshine. And you’re probably getting some back-up Vitamin D in your daily multivitamin. (You are taking a daily multivitamin, right?). You can also reduce your risk of prostate cancer by eating more fruits and veggies and less animal proteins. (If you need a protein replacement, try Vegan Protein Complete). Exercise can also help reduce your cancer risk.